I explained to her that I had, sadly, already gathered the eggs a short while before. But they could certainly go see if any more had been laid. 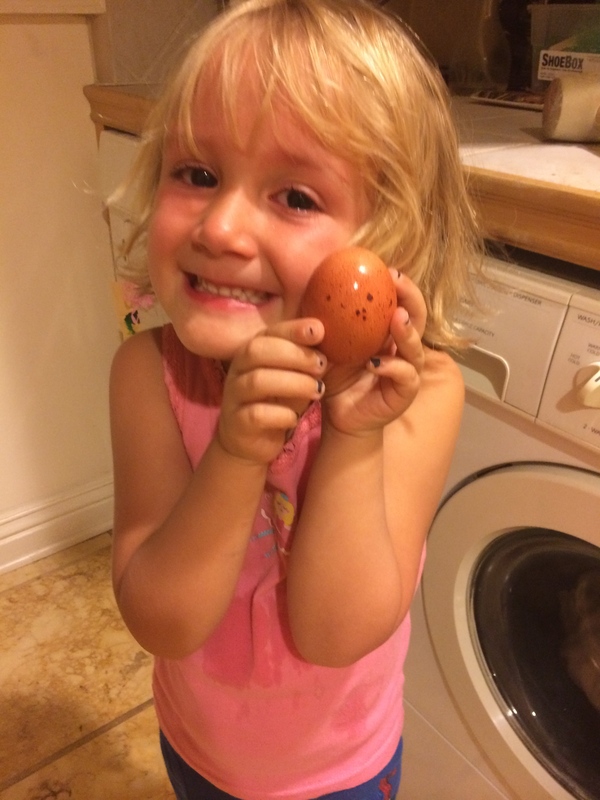 She then went on to explain to me how her 6-year-old brother, Finn, was trying to lay his own egg. I asked their mother, Amber, about this later, and she told me that Finn actually wanted to hatch a chicken from an egg, not lay an egg. I’m not certain if he planned to nest on the egg himself. She beamed and insisted to her mother that she get to carry the eggs on the short walk home. A little while later, Amber texted. I had expected her to tell me that the eggs had broken. But instead, she informed me that they were not going to be able to eat the eggs because Kinley wanted to wait for them all to turn into chickens. “She’s going to be waiting a long time,” I replied. We do, indeed, have a rooster. But he is the lowest rung on the pecking order — a small bantam Chinese silkie we call “Fluffy,” who most definitely is, as you would say, “henpecked.” In other words, we don’t think he’s getting much action. Amber texted again. They had reached a tenable solution — Kinley would keep one egg and wait for it to hatch. The others would be food. 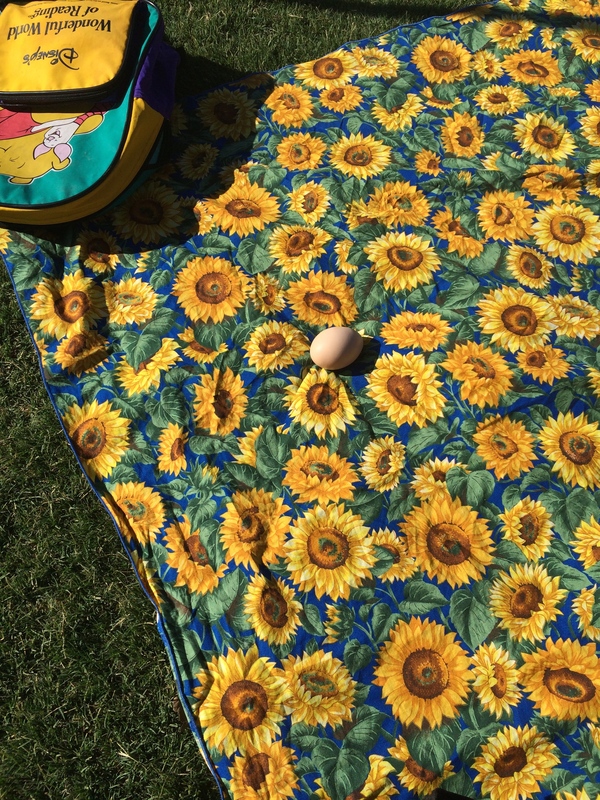 A little bit later, I received a photo of Kinley’s egg at soccer practice, given a spot of safety and honor on a sunflower tablecloth brought in her Pooh backpack just for the purpose. Fortunately, Kinley was amenable to a replacement egg. Which, as of the last I heard, was safe and well. I do hope the O’Connor family are able to eat the remainder of the eggs before the next of Kinley’s breaks — and the next, and the next after that — to be continually replaced in a futile hope of a chick-filled future. I think they actually believe I’m their mom, Overzealous. You are very good with the children my friend! I do feel a bit sorry for your lil’ rooster however . . .
Great story and photos, had me laughing out loud, thanks! Cute and funny little girl! Totally something I would have done as a kid — especially the taking it to soccer practice. Love it! I often forget to let the chickens out altogether. (What, you don’t think Steve and I have more important things to think about!???) Fortunately, we’ve got the 200 sq. ft. “Taj Mahal” of chicken coops. 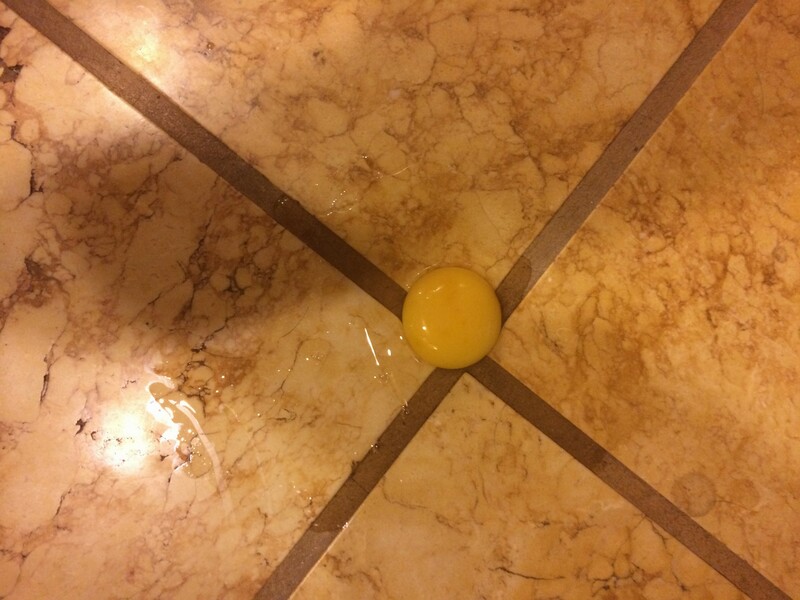 Perhaps there are better purposes to which your eggs could be put….closer to home? Hint, hint? (We could sure use a dozen). We could probably accommodate that! Production is way down right now — we’re getting around 2-4 eggs a day, I only got one yesterday! But we do have an extra dozen or two, so I’ll send a kid over later.